‘Tis the season to find a random patch of rhubarb growing in your next door neighbor’s backyard. Don’t be shy; ask him if he plans to use it. If the answer is no, chop it down and make something that tastes precisely like the beginning of summer. I tend towards simpler preparations of rhubarb: the ones that let its tangy, uniquely rhubarbian flavor shine through. The stewed compote I made is scented with vanilla, orange zest, and a touch of cinnamon with just enough maple syrup to take off the pucker-inducing edge. You may like more sweetener, in which case, add it! I like this compote best swirled into full fat, plain yogurt. The tanginess of both ingredients play well together, and the creaminess of the yogurt tempers the hint of bitterness in the ‘barb while playing up the sweeter notes of maple and spice. This morning I dolloped both on top of a steaming stack of coconut flour pancakes and declared a breakfast miracle worthy of sharing. I didn’t want to be too greedy with the free rhubarb, so I only took about 6 stalks. This recipe could easily be doubled or tripled to accommodate a larger rhubarb haul. Combine all ingredients in a heavy bottomed skilled or saucepan. Heat mixture over medium heat, stirring occasionally, until rhubarb begins to break down and become soft, about ten minutes. Taste compote and add more sweetener if desired. Allow to cool slightly and pour into jars. Keep refrigerated for up to three weeks. 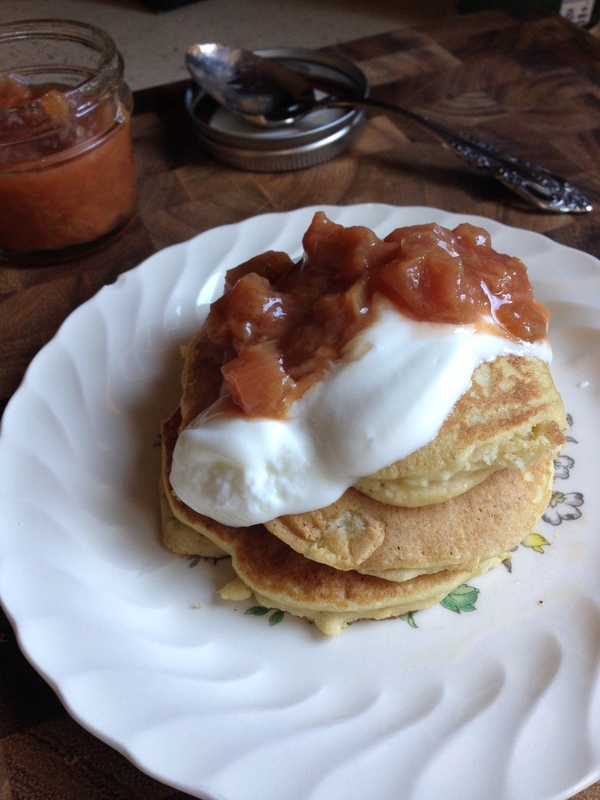 Enjoy over pancakes, waffles, oatmeal, yogurt, ice cream or straight from the jar. Lip-smacking summer goodness. I've always loved experimenting. I had a cheap microscope as a kid and there wasn't much I came across that I didn't try and put under the lens to examine. I guess maybe this is one of the many reasons I'm studying to be a dietitian, there's so much science (and sometimes seemingly alchemy) happening within our food! A week ago today, my friend Sarah gave me a priceless gift, a jar containing two SCOBYs. What's a SCOBY you ask? Well, a symbiotic colony of yeast and bacteria, of course! Up until last week I was more or less clueless about the process that went into making the bottles of expensive fizzy tea I like to drink so much. And to be honest I am still sort of hazy on the whole process. But, taking into account a bit of what I learned in microbiology last semester, I grasp that the bacteria in the SCOBY ferment the sugar (sucrose) that you add to the tea and break it down into smaller sugars (glucose and fructose) while also producing acetic acid (as in vinegar, which you will likely detect upon first taste) while the yeast in the SCOBY "eat" the broken down sugars and produce alcohol (yep, kombucha is slightly alcoholic, about 1% depending on fermentation time) and carbon dioxide (yay bubbles!). So how does it work? Incredibly easily, even for someone like me who is less-than-great at following precise instructions. 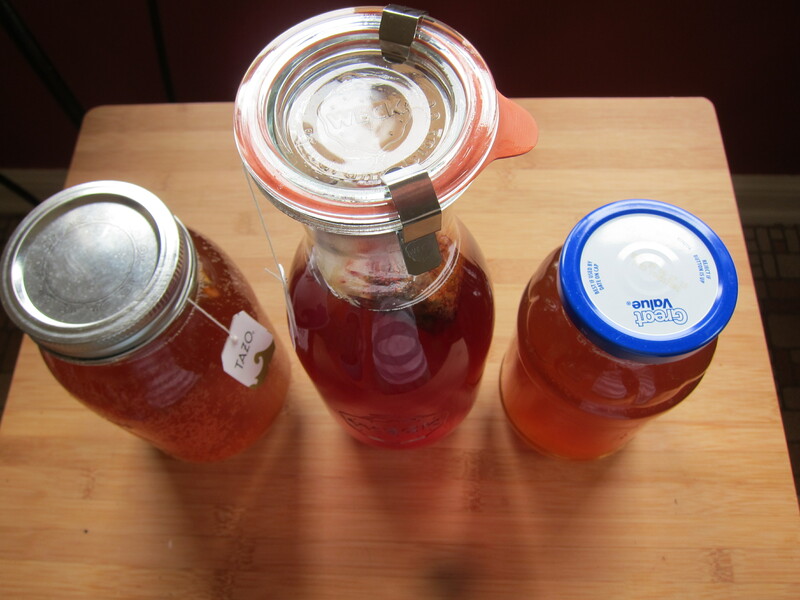 Once I got the prized SCOBYs safely home, I brewed some black tea with sugar, let it cool, poured it into two large jars, plopped in the SCOBYs, and covered the jars with rubberband-ed coffee filters. I then let the brew sit in my dark pantry for a week, excitedly peeking in on it about 10 times a day. And wah lah! 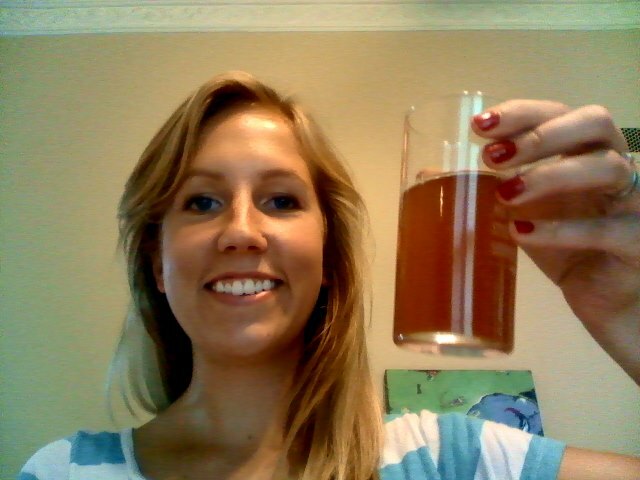 Upon tasting the finished product this afternoon, I deemed my kombucha brewing endeavor a success. This round, I bottled a jar of plain, a jar of ginger (using ginger tea) and a jar of Tazo passion tea (another great suggestion from Sarah). Below I'll post the recipe Sarah shared with me. I am super grateful to her for the SCOBYs and for helpful tips along the way. What an awesome way to get in on the DIY movement that's bubbling up from the underground these days. In terms of obtaining a SCOBY, starting chumming it up with a generous friend who you know brews kombucha, otherwise this SCOBY on Amazon has very good reviews. To a sterile (or at least very clean) 1/2 or full gallon glass jar, add sugar and tea bag(s). Pour in the piping hot water and and steep until tea is at room temperature. From Sarah, "I have read that it is best not to use metal pots [for steeping the tea]... Also, don't fill the [brewing] jars too high, keep the liquid below where it starts to taper in at the top. 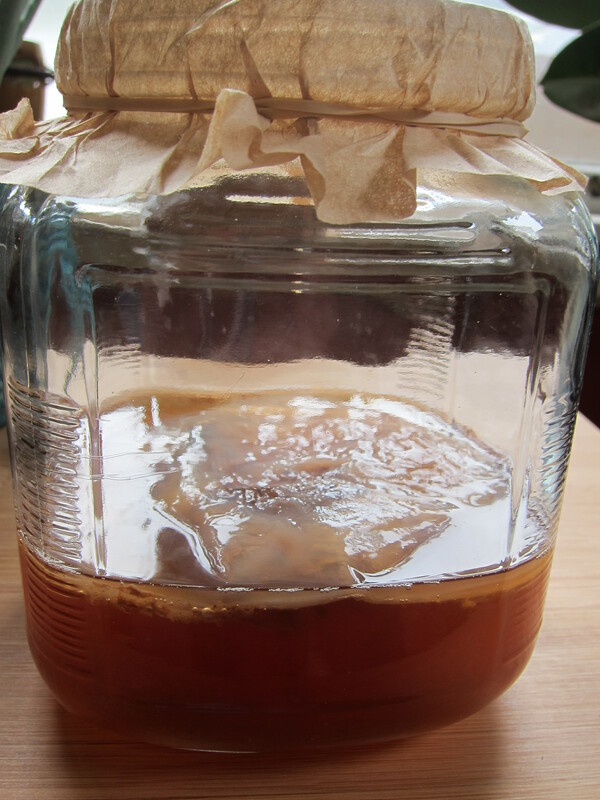 If the tea level is too high the SCOBY will grow up and cling to the glass too much, ending up out of the tea. "Cover jars tightly with a breathable barrier (cloth or paper filter). Keep at room temperature. Once tea is finished you can pour into a container and keep in the fridge. I think I read that letting it sit at room temp while capped will create more carbonation, but I'm not sure (it may explode at some point!). I like to flavor mine with herbal tea once it's finished. I add 1 tea bag per finished batch (from one 1/2 gallon jar). There are tons of other ways to flavor too. ...I usually "rinse" out clean jars with white vinegar before starting to brew in them. There is also a method for tasting for doneness - use a very clean straw, slip along side of the SCOBY, then cap straw top with your finger to pull up some tea and drop it into your mouth. Although I usually just stick a spoon in there! Or lately I haven't even be tasting, I can just tell by the smell of it now!" 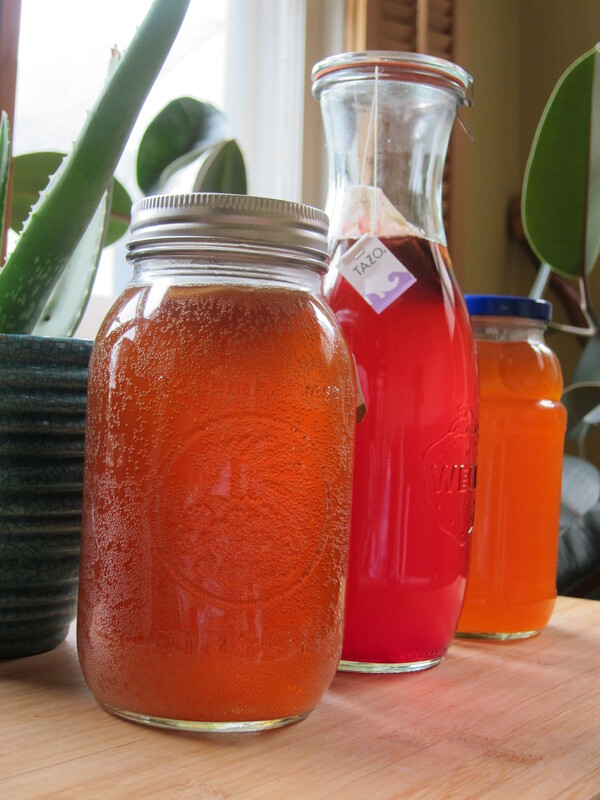 And there you have it, kombucha brewing tips from a newbie and from a pro. Sarah told me that her family enjoys drinking her kombucha so much that she's going to start brewing even more at a time. Look out GT's, you just might have some serious competition on your hands pretty soon! As promised, but probably too late use this season, I will now share my morel mushroom recipe. When it comes to a morel mushroom score, just remember less is more. Browsing the web for morel recipes, I found that even many of the “simple” ones have you coating the beauties in flour, cornflakes or get this… saltine crackers! Really, people? Really? You’ve just foraged one of the most delectable, natural gifts mother Earth provides and you are going to cover it with one of the most processed, bleached food-like substances around? No, no, no. 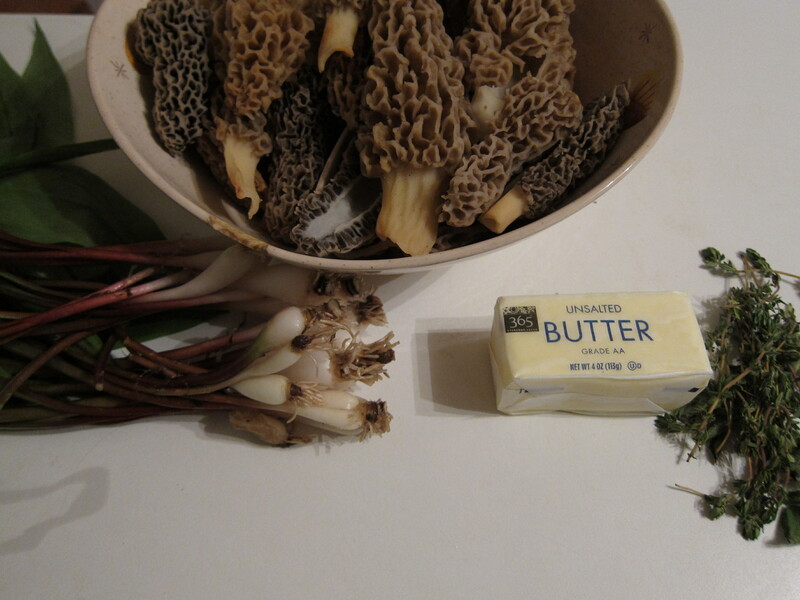 So, drawing from a faint memory of a recipe I saw a few years back in Whole Living magazine, I decided to pair the morels with garlic ramps, another fleeting springtime treat, and lightly sauté them in a shallow pool of butter and olive oil. Thyme came to the party to enhance the meaty mushroom goodness, and salt - that’s about it. The mushrooms were so savory, so umami, it was difficult to believe that no soy sauce snuck into the pan while my back was turned. There was chewiness, but no sliminess – the mushrooms were tender and the texture of the morels, with their crater-y exteriors, was like no other. The ramps, being less intense than their more bulbous cousins, infused the butter and enveloped the morels in a subtle spicy sweetness but did not overpower at all. After they were gone, I was sad, depressed even, because they were so good, and I knew it would be another year (if we’re lucky) before my taste buds would again bear the pleasure of the elusive morel. Upon scoring your morel mushrooms, thank mother nature and take mental note of where you are so you can return next year in hopes of a sweet repeat. Many ‘shroomers believe in carrying their morels in a mesh bag so as they walk through the forest, the mushrooms’ spores will fall through and hopefully sprout again the next season. In a colander, rinse your morels thoroughly of dirt. Then, gently slice them in half lengthwise and look inside their hollows for any insects who have taken residence there. At this point you can soak the morels in salt water for about 2 hours, which kills any miniscule critters and supposedly neutralizes an enzyme that causes digestive issues, though this seems to be more old wives’ tale than scientific fact. 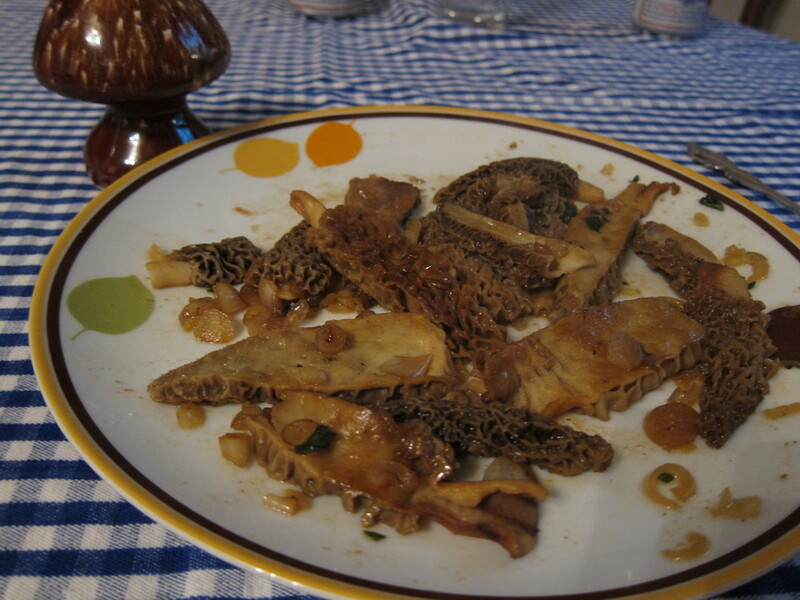 You can keep your clean and sliced morels in a shallow bowl covered by a damp paper towel in the fridge for up to 5 days, but I recommend cooking as soon as you can. Melt the butter and olive oil over medium heat in a large sauté pan until just bubbling. Turn the heat to medium-low and add the chopped ramps, stirring lovingly for a couple minutes until they are light brown and smell heavenly. Next, lay the morels, outer-side down (hollow side up) in the buttery pan. Let them cook for about three minutes, then check to see how they look: if slightly golden brown and shiny, they’re ready to be flipped. Take your time with this, turning each morel to its other side with tender care. Give them maybe two more minutes before adding the thyme leaves and coarse salt to taste. Waft the scent to your nose with an oven mitt and savor that scent. To finish, stir everything together with an old wooden spoon and remove the mushrooms to a pretty platter or thick paper plate. Savor each bite; share if you can bear it. Morels contain small amounts of hydrazine toxins that are removed by thorough cooking; morel mushrooms should never be eaten raw. It has been reported that even cooked morels can sometimes cause mild intoxication symptoms when consumed with alcohol. When eating this mushroom for the first time it is wise to consume a small amount to minimize any allergic reaction. Morels for consumption must be clean and free of decay. Morels growing in old apple orchards that have been treated with insecticides may accumulate levels of toxic lead and arsenic (yum!) that are unhealthy for human consumption.